Scarlett Shortt is just an average 18-year-old girl, but then her life takes an extraordinary turn following a road accident. She wakes up to find that the world has twisted beyond recognition – everything is very dark and different now and a bunch of teenagers she’s never met before claim to be her best friends. The group can do amazing things, such as fly, read minds and control electricity, and Scarlett is shocked to learn that she has special powers too. The reluctant superhero soon finds herself caught up in their mission to make the world a better place and overthrow the evil prime minister, Adam Goulden. Will she learn how to use her powers in time to face their dangerous adversaries and will she ever discover exactly where she is and how she got there? 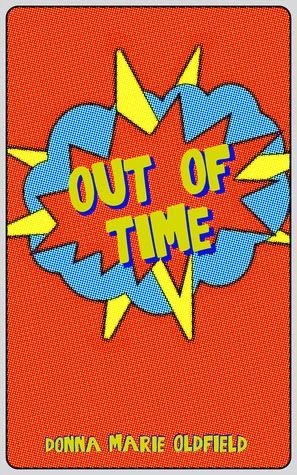 Out Of Time is the first book in a continuing series for young adults. Though this was a cute story, it reminded me quite a lot of the stories I used to write as a preteen. It's simple and adventurous, with just a hint of that first glimpse of romance. The characters are interesting enough, but not multi-faceted. While the world is an interesting place, there's just enough description to give you an idea of what it's like, rather than immersing you in it. The characters' super powers were a little too 'convenient' for me. It's mentioned a few times that their powers change over time, but so many times throughout the duration of the book, their powers just happen to change to magically fit the situation they're in. Instead of problem solving, they simply pull out a super power and it magically does whatever they need done. It was a little frustrating for me. Since this book is mostly dialogue, it's a really quick read. The upside to this book was trying to figure out the grand mystery of how much of Scarlett's life is reality,alternate reality,coma-induced, etc. Though you have an idea, it's fun to watch them try to figure it out. Though this is billed as a sci-fi book for adults, I really can't see many adults enjoying it, simply because of the simplicity and adolescent nature of the characters. Now, a preteen girl is a different story. If you have a preteen who's a little into romance and a lot into sci-fi and adventure, this book could be right up their alley.